After returning to Earth, they welcomed me back with fanfare. I've completed my training, I'm now a fully fledged Ranger! As a ranger, the true impact of the Dominators was revealed; they control more than half the solar systems in the galaxy! 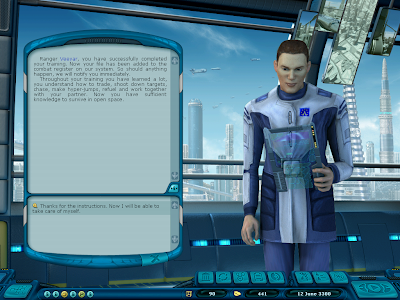 I'm tasked to find out more information at Proturbance Research Station. Hah, they are a set of comedians in research. "First you enrol in the Army, then you come to us to findd you you're fighting?" Good one. The Dominator information seemed sensitive, so I'll leave it off these open channels. Suffice to say that they aren't like us and not much is known about them. A lot of the research oriented services on offer didn't seem to appeal apart from enhancing components of my ship. It's a pity I'm a poor boy because I'm sure I'd like to improve the performance of just about everything. 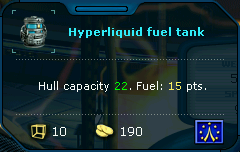 The only thing I could afford was an upgrade to the 10 tonne fuel cell to make it hold 22 units of fuel. Almost worth swapping out my 27 tonne tank for the extra space. Actually a quick glance at the starmap and there's nothing past a 20 parsec jump in range anyway. There may be other jumps that need the extra 2 units of fuel, but for now I'll swap over. They also showed me a research droid that is able to locate abandoned items on uninhabited planets. Sounds worse than scumming for rocks, but at least you don't have to wait around while it does the scanning.